Countless studies prove time and time again: DIVERSITY MATTERS. We know it, we believe it, and we want it. We, as the Carleton Women in Computer Science (WiCS), crave this more than anything. One of the ways to increase diversity in Computer Science, is supporting the minority: women. One of the most tangible ways to support women in Computer Science, is to foster an inclusive community where members feel empowered and included. We’re a huge fan of conferences – especially the world’s largest and best technology conference that celebrates women in technology: Grace Hopper Celebration (GHC). Our desire is to send as many female undergraduate Computer Science students to this conference! GHC is an incredible celebration filled with women in technology from all over the world. The last celebration had over 18,000 attendees from 81 different countries with over 400 sessions and 800 speakers. It’s a welcoming place to network, learn, and find community. We can make this happen with your support! It’s 2018, and there are just not that many women in Computer Science right now. Strange, right? From the National Center for Educational Statistics , 37% of undergraduate Computer Science students were women in 1984. By 2014, around 18% of students were women! Did you read those numbers? The percentage from 1984 to 2014 decreased. Tragic. Since the world of Computer Science is predominantly male, many females feel like they don’t belong in the field and lack the confidence they need to thrive. 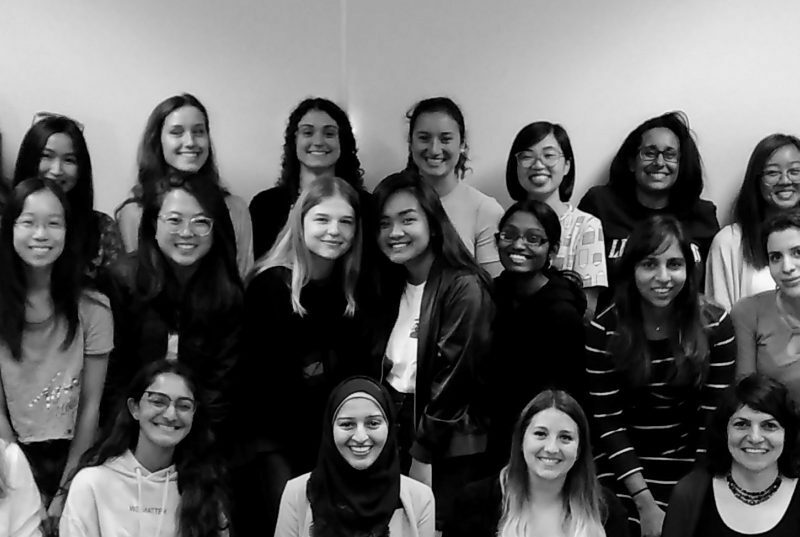 Carleton’s Women in Computer Science (WiCS) is organized by the School of Computer Science with the mission to establish a positive environment for women in computing at all academic levels. Our desire is to develop an inspiring and supportive network of female Computer scientists. In the past, we have supported many students to attend the annual CAN-CWiC (Canadian Celebration of Women in Computing). The impact on our students is hard to miss. Students who come back from conferences like CAN-CWIC feel like they can change the world with Computer Science. We believe that sending students to Grace Hopper Celebration (GHC), the world’s biggest conference for women in CS, would magnify the impact of our network and make Carleton a place where women want to come to take their first steps in the tech world. We are expecting a cost of $20,000 to support about ten students to attend Grace Hopper Celebration (GHC) from October 2 – 4, 2019 in Orlando, Florida. The funds raised will go towards the cost of registration, accommodation, airfare to Florida, and meal expenses for the undergraduate students attending the event. You’re an eager, smart, high-achieving first year. You look around your very first Computer Science classroom. It’s predominantly male. You meet your classmates. Most of them have programming experience. You feel nervous – you don’t. They talk about how late they stayed up programming-how they dream in code. You slept early that night. You dreamt about everything other than code. You then hear about a celebration filled with women in tech from all over the world. There’s 18,000 attendees from 81 different countries, to celebrate women in technology! The conference is in the United States, but it may be too expensive to attend. Then, you’re told you can get funding through Carleton’s WiCS. You apply. Eagerly waiting, you get an email that will change your life. You arrive at Grace Hopper Celebration 2019. “Am I dreaming?” You see the vast number of women in CS! You meet students from all over the world. They doubt too. They struggle too. They’re JUST. LIKE. YOU! You attend as many sessions as you can. You meet potential employers. You learn how to have successful interviews. You get tangible ideas to start outreach programs back at Carleton. You even end up interacting with internationally acclaimed women you admired from afar. These women tell you about the discrimination they’ve faced. Amidst the struggle, these women made it to the top. You can’t wait to share. Inspired, you come back and tell discouraged students that they too belong in CS! One student inspires another, and a beautiful community is formed. More women start joining CS. Carleton becomes a pillar in the CS community, with a 50/50 ratio of women and men. Unbelievable projects and ideas start forming. The world is changed. CAN WE DREAM TOGETHER TO MAKE THIS HAPPEN?